This ball head is made of solid aluminium and features a friction control, which allows micro-movements without opening and closing the headlock. This characteristic guarantees an easy and safe camera positioning. This head has been specifically designed to be extremely portable. 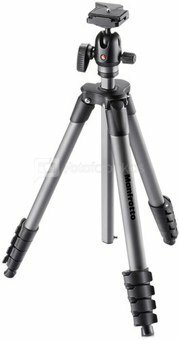 When not in use the ball head can be folded, making the tripod easier and more convenient to carry. The high performance frictioned ball head combined with reinforced, five-section tubes make this tripod the optimal solution for rigidity whilst also being able to reach the superior height of 167cm/65.7in when extended. The Compact Advanced Ball Head is available in black with a matching padded carrying bag. To preserve and protect its finishing and original colour we recommend cleaning it with a standard white pencil eraser. Special products or water could damage the finishing.